Never a child Reb Yisrael Perlow was the son of Reb Asher the son of Reb Aharon the Bais Aharon of Karlin. זצוק”ל Reb Asher was nistalek on ט”ו אב תרל”ג. Reb Yisrael, his son, was a mere four-and-a-half years old. He had shown brilliancy at that young age and the elder Chassidim, even though broken hearted at the passing of their Rebbe, found condolence in the young boy and crowned him as Rebbe to continue the holy unbroken chain of Stolin-Karlin. Thousands of people came to see a Tish headed by a young boy. Hence he is known as the Yenuka, a young boy. (In Stolin he is known as the Frankfurter, since he is buried there.) His son Reb Yochanan, the Stoliner Rebbe, when he heard someone calling his holy father, Yenuka, he would say in Yiddish דער טאטע איז קיינמאל נישט געווען א קינד- “My father was never a young child!” He strove to conceal his greatness and it was only his followers and other tzaddikim themselves who recognized his high stature in Torah and avodas Hashem as well as his remarkably perceptive vision of human events. The great Gaon Reb Yitzchok Elchonon Spector (1817- כ”ו אדר תרנ”ו -1896 ) author of many great seforim such as שו”ת, נחל יצחק על חושן משפט, באר יצחק, שו”ת עין יצחק- had a very close relationship with the Rebbe. He was once at a gathering where one of the Rabbanim casually mentioned in slander that the Chassidic Rebbes don’t know how to learn. Reb Yitzchok Elchonon let out the secret that Reb Yisrael of Stolin is well versed in all of Rambam and knows it by heart as well as any Yid reciting Ashrei! Respected by all Many gentiles in Europe were believers in tzaddikim and until today the non-Jews in Ukraine and Poland go to the graves of the Baal Shem Tov (in Mezhbuzh) and Reb Elimelech (in Lizensk), as well as in Vilednick. 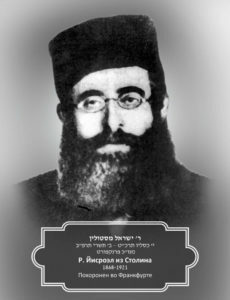 Reb Mendel Zeilingold, a Stoliner Chassid attached to three successive Rebbes, related that there was a tall, high-ranking General in the Russian army who heard that the Stoliner Rebbe, Rav Yisrael Perlow was a”Wunderrabbiner” and that by merely gazing at his face one could be helped. The general needed a personal Yeshua (which he would have termed a “salvation”) and journeyed to Stolin. Just when he arrived, a huge throng of hundreds of Chassidim was surrounding the Rebbe and he was not able to even glimpse the Rebbe’s face. Yet, he was a firm believer and lifted and held his hands above the crowd, saying to one and all, “It is enough that my hands see the face of the Rebbe. Now I will surely be helped.” It was attested at the times of Pogroms, that the city of Stolin was passed over, as many of the hoodloms respected the Rebbe. A strong bond with his son Reb Yaakov Chaim Perlowזצוק”ל the Stoliner Rebbe from Williamsburg, known as the Detroiter, (he was niftar there 6 days in Iyar 5746) was a pillar of chesed during his stay in America from 1923 to 1946. He helped thousands of people along with Mosdos Hatorah in those hard times. He traveled to many cities on fundraising missions. Once a year he would travel to Bangor, Maine, since the shochet there was a Stoliner Chasid. One year the Rebbe called the shochet informing him of his upcoming visit, but the shochet told the Rebbe that there was no one left in the commuity for the Rebbe to visit. One day the Rebbe informed his gabbai R’ Zelig Tenner that they were going to Bangor. Zelig was a loyal chasid and didn’t object, even though he knew that the shochet advised the Rebbe not to come. Their train entered the station in Bangor, Maine at 3 am and to Zelig’s astonishment, the shochet was at the station waiting for them. Zelig asked the shochet, “How did you know when to meet the train?” He replied, “Last night the Rebbe’s father, Reb Yisrael זצוק”ל came to me in a dream and told me that his son was arriving in Bangor at 3 am. I woke up not knowing what to do, but as I tried to fall asleep I just couldn’t close my eyes. So I got dressed and came to the station!” The Rebbe said humbly: “This is hardly surprising; wherever I go, my father precedes meא חידוש? וואו מיר גייען, גייט אונס אונז די טאטע פאראויס! The drasha that had an impact The Rebbe became ill at a very young age and traveled back and forth to Warsaw. When his condition became serious, he was taken to Baden Neuheim in Germany. The Rebbe was well respected by the Yekish community there and the last Shabbos before he entered the hospital, the Rebbe asked if he could deliver a Drasha and the community consented. The Rebbe spoke on the first posuk in Kedoshim קדשים תהיו כי קדוש אני ה’ אלקיכם איש אמו ואביו תיראו ואת שבתתי תשמרו אני ה’ אלקיכם- You shall be holy, for I, Hashem, your G-d, am holy. Every man shall fear his mother and his father, and you shall observe My Sabbaths, I am Hashem, your G-d. The Torah is addressing different levels of Yidden. The top level that one should attain is You shall be holy for I, Hashem your G-d, am holy. The next level is Every man shall fear his mother and his father. The third level is at least you shall observe My Sabbaths. The last and most basic level is to remember I am the Hashem your G-d. The Rebbe begged the congregation even though you may not be at any of the top levels at least remember the last level and don’t assimililate. A Yid who was at the drasha and later ended up in a Kibbutz and was not observant, said that drasha penetrated deeply into his heart and he didn’t assimilate and made sure that a bris was performed on his children and grandchildren. A story is told about the “Yenuka” of Stolin (Rav Yisrael Perlow Zatza”l), who was approached by a man who felt he had killed his father. This man had suggested that his father undergo a certain surgical procedure, which had resulted in the father’s death. “If only I would have not suggested it” ,the man cried, “my father could have still been alive”. The Yenuka answered him as follows: The words “would have” and “could have” are Keffirah.